Characterized by two coinciding histories since its first cities were founded six thousand years ago, Iraq has experienced both the pinnacles of world civilization and large scale destruction at different times in its history. Subjected to unyielding violence and ruin, Iraq currently has the world’s attention. Yet its rich cultural narrative continues in the work of its artists. Conscious of their complex history, contemporary Iraqi artists employ a diverse visual culture that utilizes and projects its multiple identities. Having lived through various periods of Iraq’s modern history, the art of Kareem Risan reflects a multidimensional cultural heritage that has survived decades-long devastation. 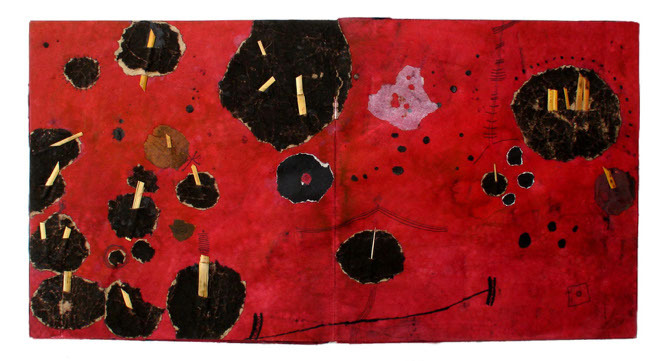 Born in 1960 in Baghdad, like countless Iraqi artists of his generation, Risan’s work is visibly rooted in what seminal Palestinian writer and artist Jabra Ibrahim Jabra described as “an indigenous quality…achieved when they [Iraqi artists] have struck roots in their own soil and delved into the historical layers of a vast uneven heritage, the accumulation of forty centuries or so.” The fundamental nature and creative force that has propelled the evolution of Iraqi art is what curator Ulrike al-Khamis has described as “Its conscious and committed attempt to create a synthesis between historical Iraqi art forms and modernism.” Concurrently, modern and contemporary Iraqi art has remained impacted by that endured by its people. Whereas the function of art and its role in a given society continues to be disputed, for nearly a century art has negotiated every defining juncture of Iraqi society for the majority of its artists—whether political, historical or cultural. This element is ubiquitous in Risan’s paintings, books and objects. 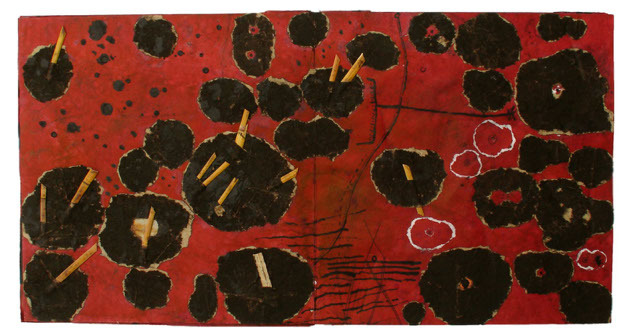 Drawing from a vast history of modern painting in the Arab world, one which incorporates both regional and international aesthetics, his work is often a testimony of a dramatically shifting environment. Early on in his artistic development, painting became a response to turbulent surroundings. After graduating from Baghdad’s Academy of Fine Arts in 1988, Risan served in the Iraqi military, an experience he subsequently explored in a series of drawings. Despite the increasingly tragic fate that befell his homeland and the difficult living conditions that resulted, Risan continued to live and work in Iraq until 2005; he was forced to leave when the violence following the 2003 American-led invasion escalated to such heights that his life was threatened. Consequently, much of his recent work was created while living in exile in Jordan and Syria, an experience that separated Risan from his native country only in physical proximity, as his work remains absorbed in its past, present and future. Thus we find reflections of Iraq’s changing political landscape in his work, while the cultural and social ramifications of living under repression, wars, sanctions and occupation are articulated in composition, palette and title. 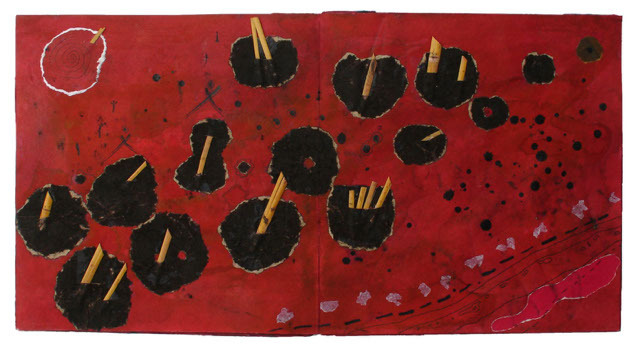 Two compelling examples are the commanding mixed media hand-made books Uranium Civilization (2001) and Occupied Baghdad (2004). 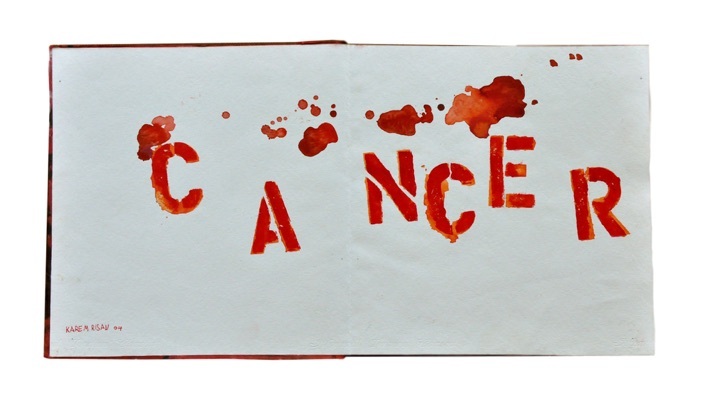 Several of Risan’s books recently appeared in the British Museum’s groundbreaking 2006 exhibition “Word into Art” and “Dafatir,” a touring exhibition of contemporary Iraqi book art that originated at the University of North Texas in 2005. 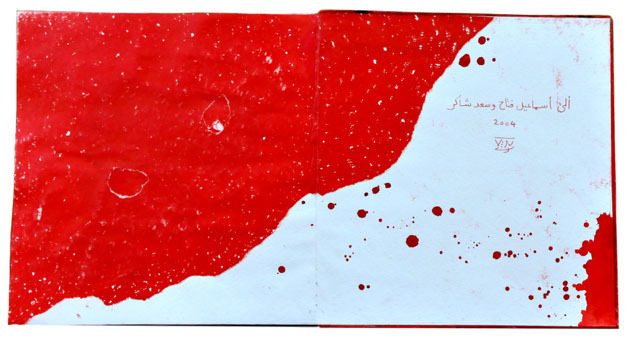 Comprised of several double page spreads, the artist’s accordion books are part of a recent resurgence in Arab art that pursues a cultural legacy derived from a reverence for literature, calligraphy and text—one that has transformed and traversed visual culture in the region for centuries. In Uranium Civilization, the artist employs text and painted imagery to create powerful expressions reflecting the lingering turmoil plaguing his homeland, while simultaneously calling attention to the fact that the destruction of Iraq began long before the recent invasion. Rendered in dark unsullied colors, the painted series speaks of the nightmarish effects caused by depleted uranium used during the Gulf Wars by American and British forces. 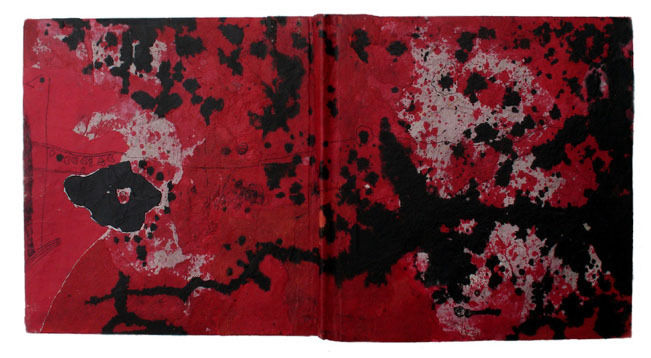 On one page of the artist’s book, aggressive crimson red brushstrokes seep through a tar-like black formation evoking an oil spill, while elsewhere Arabic writing insinuates a human form and tallied marks suggest a body count. In another section, a black form placed in the center of two pages is punctured by separate foreign bodies. 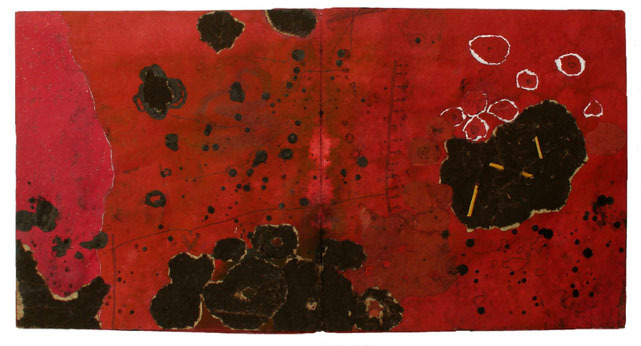 Gaping holes marked by thick red brushstrokes are reminiscent of blood stains, as the black form is caught moments before its inevitable destruction. Caught in motion, the destruction appears slow, as the cancer-like orange and purple forms rip apart the central body. 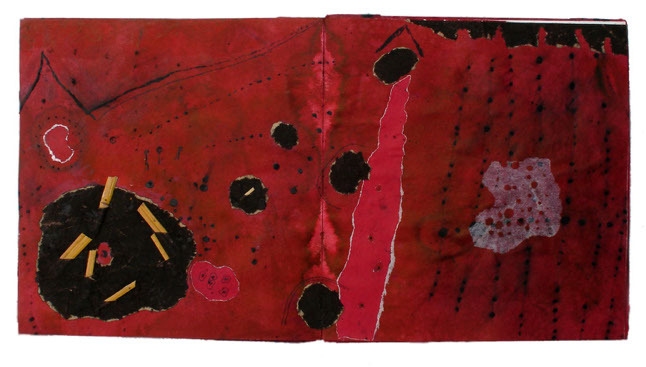 In 1994, in her critically acclaimed collection of diary entries “Baghdad Diaries,” Iraqi artist Nuha al-Radi wrote: “The depleted uranium left by the U.S. bombing campaign has turned Iraq into a cancer-infested country. For hundreds of years to come, the effects of the uranium will continue to wreak havoc on Iraq and its surrounding areas.” In 2004, al-Radi died of leukemia, a fact that points to the tragic state with which Iraqi artists are faced and thus respond to with profound urgency, as seen in Risan’s Uranium Civilization. 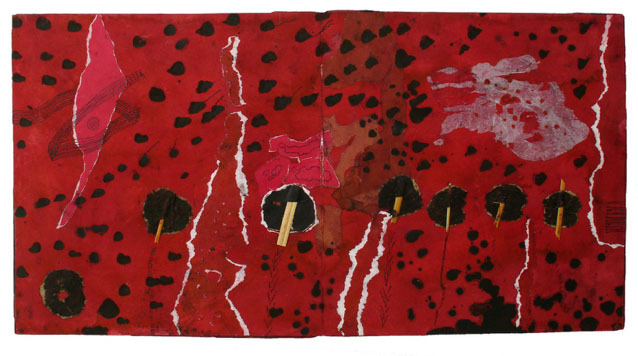 Dominated by a vibrant and warm palette consisting of mostly red, black and brown hues, Occupied Baghdad employs Risan’s distinct abstract color-saturated compositions. Dramatic lines fragment spaces, rendering multiple planes in which inundated colors merge as colliding forces. The precision of these thin lines, as they cut through, interrupt and dictate the nature of the composition, resemble military barricades, checkpoints—even the foreboding of the “security” barriers now dividing the city. 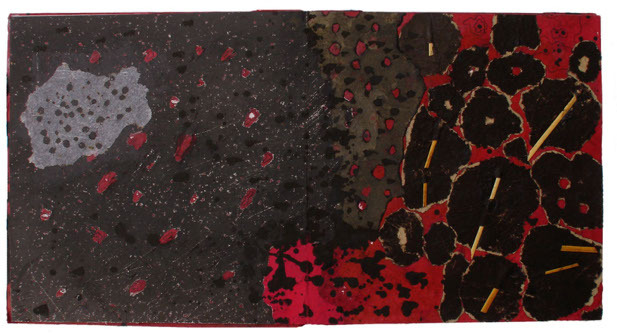 Various nuclei formations of color lie surrounded or marked by dark blotches and holes where the white, grainy nature of the paper from which the book is constructed is revealed. This serves as a haunting reminder of the extent to which the peril effects of the American occupation of Iraq have permeated and destroyed every aspect of daily life in the war torn country. Evident departures from earlier works in which compositions were executed in earth tone palettes that evoked Iraq’s celebrated sun-drenched terrain, Uranium Civilization and Occupied Baghdad speak of an artist’s response to an unfathomable reality, while simultaneously demonstrating that just as one’s home becomes unrecognizable amidst mass destruction, creative expression responds. Jabra Ibrahim Jabra. Iraqi Art Today (Baghdad: Al Wasiti Festival, 1972). Graduated From Fine Arts College 1988 – Department Of Painting – Baghdad. 2009-Solo Exhibition .Gallery Hittite .Toronto . 2005 - Solo Exhibition . AL Riwaq Art Gallery.. Al Bahrain. 2004 - Solo Exhibition .Dar – ALANDA Gallery . Amman . Jordan. 2002 - Solo Exhibition . Hewar Gallery . Baghdad. 1996- Solo Exhibition . Hewar Gallery. 1992 - Solo Exhibition .National Museum . Baghdad. 2010- MY home land. Objact exhibition for six artist. Art Sawa Gallery .Dubai . 2010- Beyond The War. exhibition for seven artist. Milani Heller Gallery. New York. 2009 – Modern A art in the Iraq exhibition in Wallach gallery Columbia University . New York . 2008 - Iraqi artists in exile - an exhibition at the Museum of the station . Houston Texas . 2007 – Art books Exhibition For Iraqi Modern Artists . Art Books Center . New York . 2006 – Iraqi Art modern exhibition . Montparnasse Museum . Paris, France . 2006 – Art books Exhibition For Iraqi Modern Artists . Minnesota University Gallery . USA. 2005 – Art books Exhibition For Iraqi Modern Artists. Texas University Gallery . USA. 2005 – Seven Iraqi Artists 4 Walls Gallery. Amman. 2005 – Seven Iraqi Artists . East & West Foundation . Amber Art Gallery .Netherlands. 2004 - Artists Books Exhibition .Ten Iraqi Artists . Frank Fort Exhibition International. 2003 - Iraq Exhibition (Now, Before, After) Deluxe Gallery . London. 2003 - Five Iraqi Contemporary Artist . Green Art Gallery .Dubai. 2003 - The Broken Letter Exhibition. Arab Contemporary Artists Exhibition. Kunst Gallery . 2002 - Seven Iraqi Artists Exhibition . AL Barih Gallery . Al Bahrain. 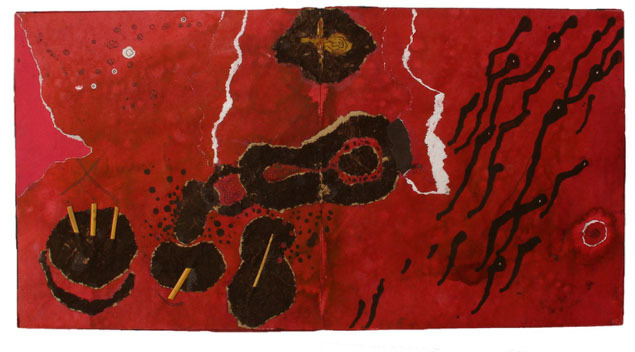 2002 - Contemporary Perspective For Arabic Art Institute Arab World Paris. 2001 - Iraqi Contemporary Art Exhibition . China International Museum. 2000 - Iraqi Contemporary Art Exhibition .Tunis. 2000 - Iraqi Contemporary Art Exhibition . Modern Art Museum In Caracas . Venezuela. 2000 - Mesopotamia Exhibition . Darat Al Funun Jordan. 1999 - Iraqi Graphic Exhibition . Darat Al Funun . Jordan. 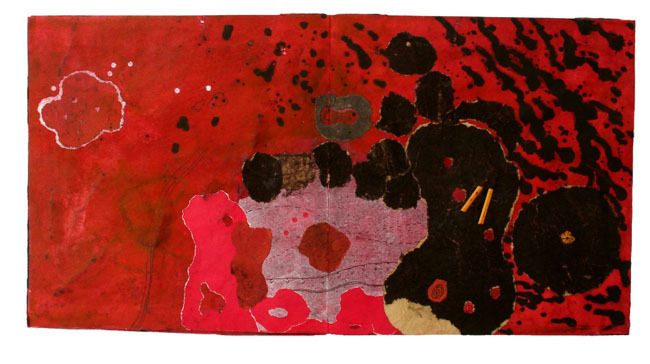 1999 - 3rd Egyptian International Print Triennial. 1998 - Muhres International Exhibition . Tunis. 1994 - Chair Exhibition . Arabic Contemporary Artists .Darat .Al Funun - Amman. 1993 - Joint Exhibition . Nevada University . U.S.A..
1992 - Muhres International Exhibition . Tunis. 1990 - Kan Surmer Exhibition . France. 1988 - Between Tigris And Euphrates Exhibition . Institute Arab World . Paris. 1988 - Cairo 3rd Biennially For Plastic Art . Egypt. 1986 - Fredrik Shtad Graphic Biennially . Nor Way. Arabic Museum - Qatar , Dart Al Funun , Kinda Foundation , British Museum , Spanish , Dubai , Lebanon , Tauch @Art london , Athar Gallery.